It has come to our attention of certain facts relative to some perceived nexus or "authority" that you as the "State Parks Administrator" with the DEPARTMENT OF LAND AND NATURAL RESOURCES/STATE OF HAWAII, claim to have in regards to The Iolani Palace situated within the 10.982 acres, more or less located at King Street, Likelike Street, Hotel Street, Richards Street, on the Island of Oahu, Hawaii-TMK: 2-1-25-2 and some alleged "Rules" that govern same. 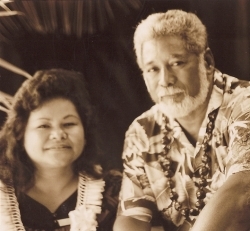 On September 26, 2008 you made public statements to an Oahu Media source that, "There are those who feel the state has no authority over the grounds. We feel otherwise." Although we appreciate your dedication and commitment to caring and "protecting" the Iolani Palace, its grounds and the significant and historic belongings and artifacts therein and the efforts and good intentions you have proven through your positions and chosen profession, we are now in a legal/commercial position and situation and must Accept your public statements and actions For Value and request that you bring the proper evidence and proof of your claim forward so as to substantiate your claim and position and relieve you of any legal and commercial liability incurred by you and or your office and affiliates. Proof(s) of Claim (bring forth evidence) in behalf of THE STATE PARKS DEPARTMENT WITH DEPARTMENT OF LAND AND NATURAL RESOURCES/STATE OF HAWAII, that there's no fraud on any claim of title, action(s), LEASE or claim of authority nor any unconscionable contract affecting any such land and/or the Kingdom of Hawaii Nation; That you and/or your office did in fact have a meeting of the minds with His Majesty Akahi Nui, the Lawful Heir and the Sovereign Authority over the Hawaiian Islands, The Iolani Palace and the Holder in Due Course of the Allodial Royal Land Patent Deeded Lands therein, and Proof of Claim (bring forth evidence) as to any agreement, contract, lease, rental agreement(s) and whatever lawful or legal authority you claim dominion over land and property within the Hawaii Islands. Bring forth evidence that THE STATES PARK DEPARTMENT, as the alleged land owner and or the THE DEPARTMENT OF LAND AND NATURAL RESOURCES/STATE OF HAWAII, have given or gave full disclosure to the alleged acquired titles/deeds/quiet title actions/quick claim deeds INCLUDING BUT NOT LIMITED TO LEASES and any contract(s) that were signed throughout the history of the alleged title/contracts and that you, Daniel Quinn, as acting STATE PARKS ADMINISTRATOR have acted honorably by investigating all the facts before making decisions, choices, orders and/or PUBLIC STATEMENTS TO THE MEDIA. 1. PROOF OF CLAIM you and your department can provide a copy of the 'TITLE' of the Iolani Palace, the property in question showing ownership and Title in said property proving that THE DEPARTMENT OF LAND AND NATURAL RESOURCE/STATE OF HAWAII is not failing to provide proof of authority? 2. 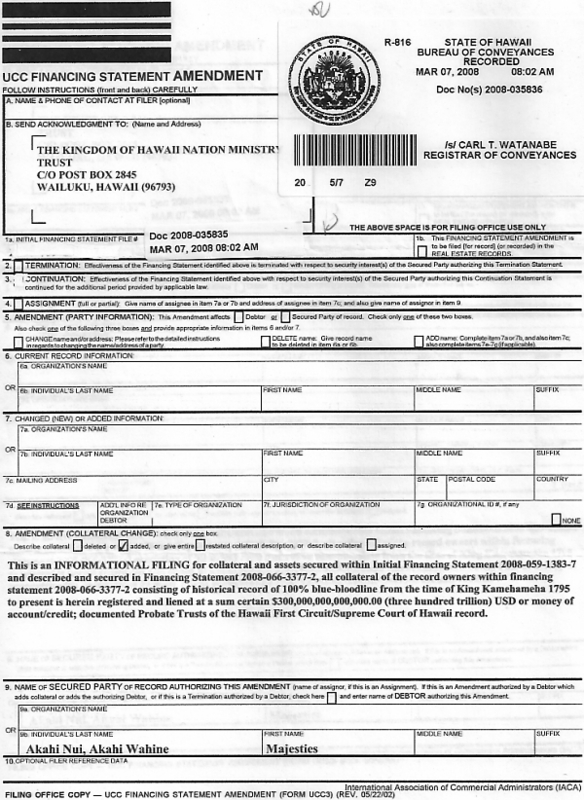 PROOF OF CLAIM that, LAURA THIELEN- CHAIRPERSON FOR THE DEPARTMENT OF LAND AND NATURAL RESOURCES, IS NOT ALREADY IN FULL DEFAULT WITH A PRIVATE ADMINISTRATIVE PROCESS AWAITING SERVICE OF TORT CLAIM; AND IS ALREADY IN FULL AGREEMENT OF FACTS IN FAVOR OF MAJESTY AKAHI NUI; THAT SHE IS ACCOUNTABLE AND LIABLE, UNABLE TO BRING FORTH PROOF OF TITLE OR AUTHORITY ON BEHALF OF THE DEPARTMENT OF LAND AND NATURALS AND HAS AGREED FOR A LIEN TO BE FILED AGAINST HER THE DEPARTMENT OF LAND AND NATURAL RESOURCES FOR THEIR RECKLESS AND MALICIOUS ACTIONS. 4. PROOF OF CLAIM that THE DEPARTMENT OF LAND AND NATURALS is not already in DEFAULT and full agreement that Majesty Akahi Nui is a direct descendant of King Kamehameha III and has acknowledged that fact IS documented by Honorable Lorrin Andrews; In the matter of the Estate of His Majesty Kamehameha III, Judge of Probate - Cause Number; 2410 dated April 2, 1853. 6. PROOF OF CLAIM that the filing of Financing Statement No. : 2007-287-2418-3 and 2007-192182 which includes ALL Royal Land Patents and Allodial Patent Lands, does not establish a Superior Security Interest and lien on the property identified therein with The Kingdom of Hawaii Nation and Majesty Akahi Nui. 7. PROOF OF CLAIM that the ROYAL PATENT DEED No. 1028 DECLARATION OF CONFIRMATION Document is not recorded and filed with the BUREAU OF CONVEYANCES at 1151 Punchbowl Street, Honolulu, Hawaii 96803-2867. 8. PROOF OF CLAIM ALL alleged land owners, companies, title companies, corporations, including but not limited to THE DEPARTMENT OF LAND AND NATURAL RESOURCES or whomever, sold, transferred or signed titles, deeds, quiet title action(s), quick claim deed(s), any other land contract(s), since 1853, acquired 'lawful title' to any of the said lands found within the Kingdom of Hawaii Nation and that THE DEPARTMENT OF LAND AND NATURAL RESOURCES IS NOT ALREADY IN FULL DEFAULT AND AGREEMENT that the past and current titles, deeds or otherwise that were sold, bought, transferred, exchanges or otherwise that the co-called 'buyers' did not only acquire 'Warranty Deed', being a promise as to a clear title. 9. 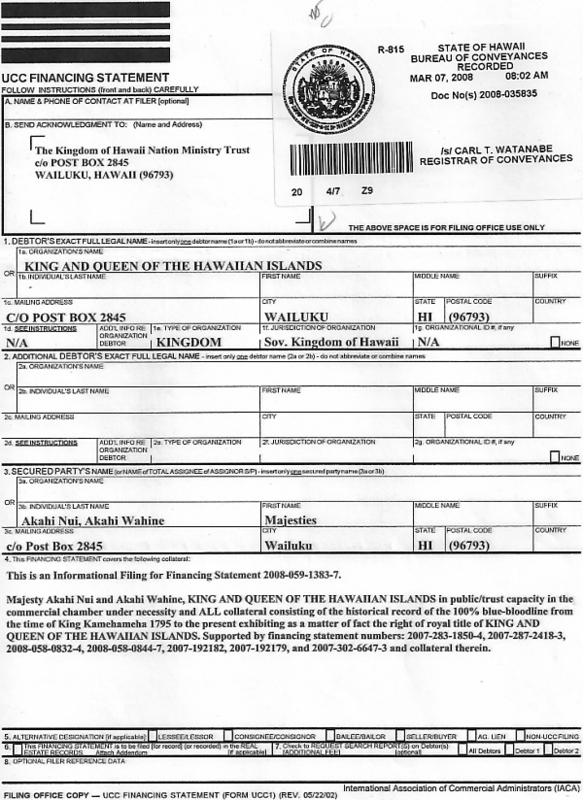 PROOF OF CLAIM that Majesty Akahi Nui for the Kingdom of Hawaii Nation by and through the The Kingdom of Hawaii Nation Ministry Trust is not the holder of the Original Title to the property as described in Financing Statement 2007-287-2418-3 and 2007-192182 and the Iolani Palace secured and documented in Financing Statement No(s). : 2008-035834/ 2008-035833 (BOC Hawaii) and 2008-065-2991-4 (Secretary of State Washington). PARKS ADMINISTRATOR for the DEPARTMENT OF LAND AND NATURAL RESOURCES/STATE OF HAWAII does not agree that via said Public Notices, being un-rebutted, stand in the public record as true and that the world at large has not failed to object. limited to THE DEPARTMENT OF LAND AND NATURALS/STATE OF HAWAII or any other person or entity at anytime has produced lawful title superior to that held by Majesty Akahi Nui's. 13. PROOF OF CLAIM that you; DANIEL QUINN, as acting STATE PARKS ADMINISTRATOR, THE DEPARTMENT OF LAND AND NATURALS/STATE OF HAWAII has acted honorably and with clean hands by investigating all the facts dealing with the existence of the 100% Lineal Heir Majesty Akahi Nui for the Kingdom of Hawai i Nation before making YOUR PUBLIC STATEMENTS TO THE MEDIA, decisions, choices, orders or otherwise and or that you do not have a personal conflict of interest in such by perceiving to own land yourself within the Kingdom of Hawaii Nation. 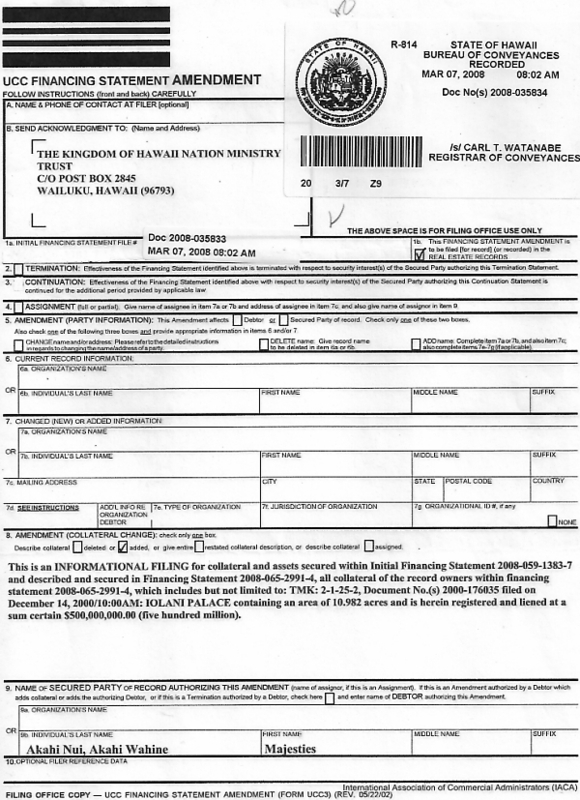 14.PROOF OF CLAIM that Majesty Akahi Nui, does not have Right of Entry, Right of Possession, 100% Ownership and a $500,000,000.00 (Five-Hundred-Million) Security Interest (lien) documented within Financing Statements: 2008-059-1383-7; 2008-035834 and 2008-035833 to the IOLANI PALACE AND THAT LINDA LINGLE/THE STATE OF HAWAII IS NOT IN FULL AGREEMENT OF SAME BY AND THROUGH DEFAULT. 15.PROOF OF CLAIM that Majesty Akahi Nui, a direct descendant of King Kamehameha III does not have a lawful Right, as 100% Lineal Heir, to be in full control and Rein as the Sovereign Authority over all of the Kingdom of Hawai i Nation, including but not limited to every acre of said soil, land and property of and within these Hawaiian Island which includes the Iolani Palace AND THAT LINDA LINGLE/THE STATE OF HAWAII IS NOT ALREADY IN FULL AGREEMENT OF SAME. We wish to resolve this issue as soon as possible; Therefore, upon you or your offices (employees, representatives, agents or officers) failure or refusing to produce or provide the requested Proof(s) of Claim, you will fail to state a claim upon which relief can be granted and said failure or refusal constitute 'your' agreement of all the facts operate in favor of the Majesty Akahi Nui. Upon your dishonor and default in this matter, your said silence constitutes stipulation, admission and confession of fraud on the matter, that you, DANIEL QUINN, Acting STATE PARKS ADMINISTRATOR for the corporate STATE OF HAWAII and all corporations, including but not limited to the corporation; DEPARTMENT OF LAND AND NATURAL RESOURCES, including their representatives LAURA THEILEN (Chairman) and others, have committed unconscionable act's and you agree that there has been no meeting of the minds between you, THE STATE PARKS DEPARTMENT, DEPARTMENT OF LAND AND NATURAL RESOURCES, the corporate STATE OF HAWAII and The Kingdom of Hawaii Nation by/and through the Kingdom of Hawai i Ministry Trust; that THE DEPARTMENT OF LAND AND NATURAL RESOURCES, failed to give full disclosure as to their authority; and that you agree that acting as STATE PARKS ADMINISTRATOR for the STATE OF HAWAII failed and neglected to act honorably by refusing to recognize the lawful existence of the Royal Family Majesty Akahi Nui and Akahi Wahine; therein causing personal injury, commercial injury, libel, slander, defamation of character and damage to the Undersigns. You will by your dishonor and default, waive all right to defend and/or yourself and any corporate entity doing business within the STATE OF HAWAII including, but not limited to DEPARTMENT OF LAND AND NATURAL RESOURCES, and is estopped in any defense to the matter. Therein, presumption will be taken in regards to your dishonor, admission, confession, injury and damage and failure to state a claim, that you; DANIEL QUINN in your private and official capacity recognize the proper, historical and lawful existence of the Lineal Heir His Royal Majesty King Akahi Nui, The Kingdom of Hawai i, that Majesty Akahi Nui and Akahi Wahine are the true Sovereign Authority over the Hawaiian Islands and that you will retract your statements made on 9-26-2008 wherein you assert authority over the Iolani Palace and the grounds therein. Through your default and acceptance you will be giving permission for a lien to be filed against the STATE PARKS ADMINISTRATION WITH DEPARTMENT OF LAND AND NATURAL RESOURCES AND YOURSELF, for said malice, fraud, injury, wanton and reckless actions, default and dishonor for damages, under necessity as a matter of Right. Due to the nature and recent urgency of this matter, you are to respond within 10 days by return mail, certified, to the Undersigned and a copy to the Third Party or Notary as addressed below.